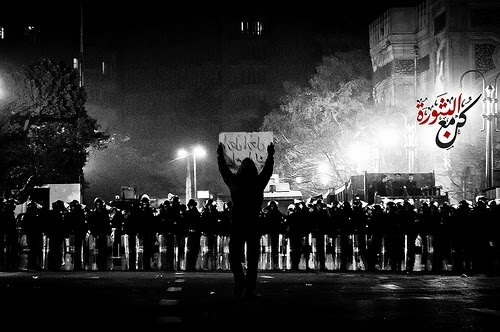 Egypt is now having her fight against brutality, corruption, and dictatorship. For sure, it is not a walk in the park, but your love, devotion, and compassion will make it a little easier, a little brighter. I might say that Egyptians have crossed, once again as they did in 1919, a gloomy door in between fear and courage, darkness and light. They made their big debut step with tears and blood, and the marathon isn’t finished yet: there’s a long run we have to go, and we are so keen to do it, and we will not let anybody turn us again to point zero. In 1919 there was a great revolution against colonialism; in 2011 it’s a revolution against a regime which you can describe just as ugly as colonialism itself. As our grandfathers fought in 1919 for our independence, we too are fighting for this for the generations to come. We are fighting for a place where humans and their rights are respected, a place under the sun where our daughters and sons will be proud to be a part of, proud to live in, and proud to build up. What I wish to say is that you, being Americans, should know that the main ally for Mubarak, and for the SCAF, is your administration. I call you to do whatever you see as valuable to make people around you acknowledge this truth: SCAF is even worse than Mubarak, and the US is backing it. The SCAF doesn’t hesitate to kill innocent Muslims and Copts, has court marshaled more than 13,000 Egyptians, sexually harasses and assaults activists, and in the protests which are taking place now in Tahrir there have been 42 people killed and more than 3,000 people injured until this very moment. The SCAF does all of this to keep itself, by any means, above the law, above the state, above any elected parliament or president. The US has a responsibility, a direct responsibility, for what SCAF is doing, being the donor of 1.2 BILLION dollars every 12 months, which makes a fifth of the whole SCAF budget (Yes! Their budget can reach something like 6 BILLION dollars every year), and if the US is genuine in saying they support the Egyptian people, and they are eager to help them reach democracy, they must show real action, not just offer pretty, sweet words. I am not trying to incite the American administration to fight our war because we are already fighting it -in Tahrir, in Alexandria, in Suez, in Upper Egypt, and even on streets as small as Muhammad Mahmoud, for nearly over a year now. And as a matter of fact, I never count on administrations or governments; I always count on you, the people. We just need you, all of you, to spread awareness of what’s happening in Egypt now. I, personally, thank you so much for being here for us. That will always remind me that we are all humans, and we all share the same yearning for justice and love. This statement is to be read today, 28th of November 2011 in a demonestration for supporting the Egyptian people in front of the Egyptian embassy, Washington DC. Organized by Occupy Wall Street. - My thanks goes to my dear freid Meaghan Conner who edited this.